Sacral Power - Earth/Lower world/Yin. Seat of divine feminine/kundalini-shakti, Connection to the earth mother, rooting, nourishment, belonging, lineage. Foundational Tool = Kundalini (weaves 3 worlds together). Right action. Heart Power- Middle world/Present. Seat of divine LOVE, connection to others, connection to Self, learning to lead/create/expand from this place--out into extension of hands/what we create express in the world). Foundational Tool = Art/creativity. Right Loving. Head Power - Upper World/Yang. Seat of divine masculine/shiva energy of consciousness, awakening, connection to heavens/stars/universal spirit, expansion, ascension, connection to the whole). Foundational Tool = Shamanism. Right thinking. We’ve found the 3 particular mystic tools we’ll be sharing in this course, activate the Three Power centers systematically + simultaneously like a alchemical triage to reactivate physical feminine, spiritual masculine, heart human integrated creative expression of love flowing into the world—all to bring you back into the Mystic Middle. Reflect: Where are you on the Heroine’s Journey right now? Kundalini is life force energy coiled up at the base of your spine, seated in root of the Sacral Power Center. 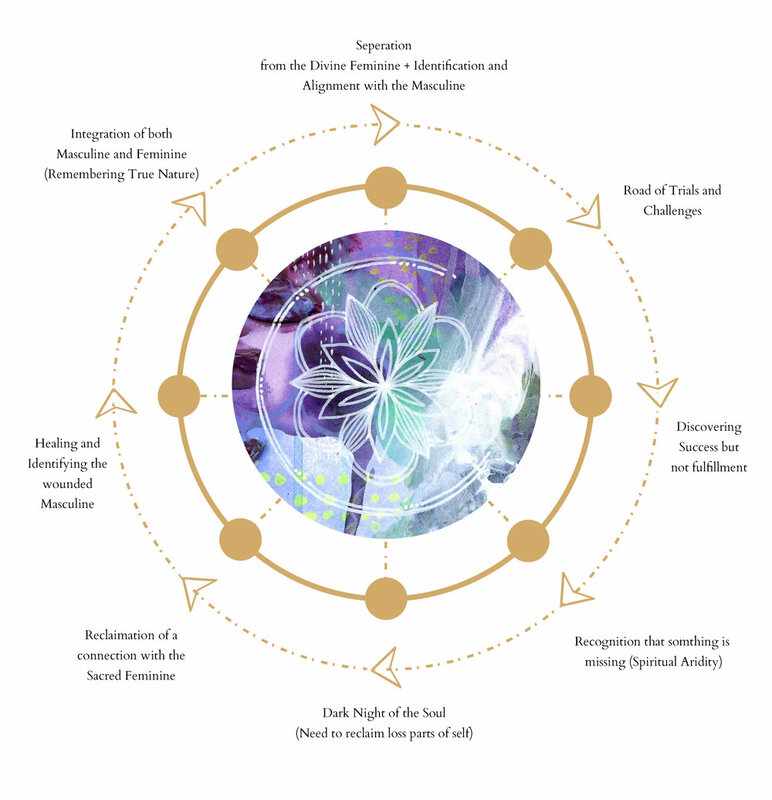 Activating the Kundalini-shakti energy within is really all about reclaiming, reconnecting and restoring the sacred feminine energy. You are literally pulling it up from within yourself. This practice restores your personal power by cultivating deep self healing, removing fear and anxiety, connecting you to your Infinite Self, and by helping you to break through blocks to your creative power. These Kundalini Kriyas, meditations and mantras deeply restore, nurture and empower you. Kundalini uses Movement to align your physical body with the sacred geometry of the universe. In Kundalini Yoga and Meditation, we are moving the energy up from the earth, stirring in the Sacral Power Center and out into the whole body, activating, clearing and raising the vibration in all of the centers. Ideas: Keep a kundalini journal to make notes about your practice. Try out the practice everyday for 40 days (the ideal given time). When you practice a kriya or meditation consistency it builds momentum, self trust + self worth. Kundalini: Try the Kriya + Meditation out at least three times this week or experiement with practicing every day. We will be practicing right along side of you. You can practice the Kriya in it’s entirity or choose a few of the exercises within the set to utilize as a warm up for the Meditation. Begin practicing the meditation for 3 minutes and work up to 11-31 minutes. Reflection: Where you are in the Heroine’s Journey? Reflect on this + perhaps spend some time journaling about this.